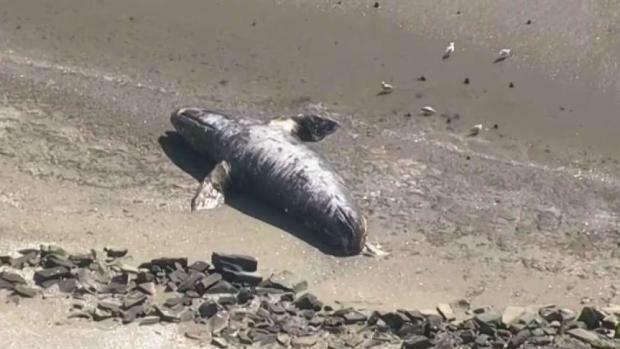 Two more dead whales were discovered in the Bay Area this week, one in the East Bay and another on the Peninsula coast, according to authorities. A whale's carcass was discovered this week at the Brooks Island Regional Preserve in Richmond, the U.S. Coast Guard confirmed Tuesday. Later in the day, a dead whale was reported in the water off the shores of Pacifica, and it eventually washed up in the rocks at Manor Beach, according to the National Oceanic and Atmospheric Administration. The Coast Guard said the whale carcass in Richmond could be the same one spotted over the weekend. Two more dead whales were reported in the Bay Area this week, one in the East Bay and one off the Peninsula coast. Marianne Favro reports. The Marine Mammal Center says three of the seven dead whales found in the Bay Area this month died of malnutrition. It's still unclear what happened to the whales found Tuesday. "It could honestly be a variety," said Barbie Halaska, necropsy manager for the Marine Mammal Center. "If there's warmer water, the food source is very limited, so that's why we go out there to do necropsies. And we collaborate with a lot of different researchers and biologists along the West Coast." 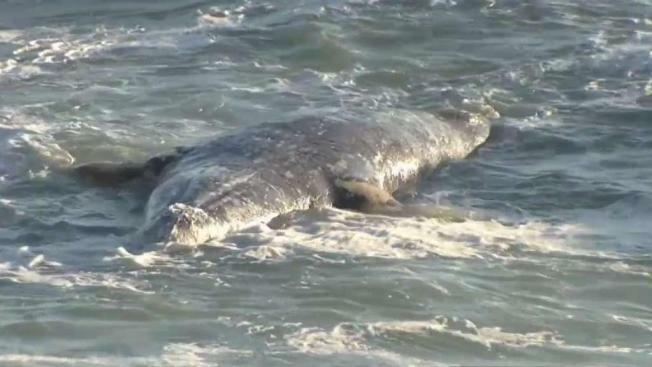 Earlier this month, a dead gray whale was found washed ashore in Rodeo. At least two other gray whales have been found dead in the San Francisco Bay this year.